Lock in a great price for San Remo Hotel – rated 8.4 by recent guests! Great location. Very clean. Wonderful staff. Cool decorations. The old atmosphere and feel of the place was amazing. Very quaint and quirky historical property close to the waterfront. It was quiet, clean and safe. I would stay here again. The location is good, easy to walk to the beach. I have ever stay in many hostel this is the one of the best ever. Room and facility were clean. The hotel is absolutely beautiful. The location couldn’t be beat it was so central to everything. The staff was friendly and very accommodating. Great location and fun in a weird, nice way. The rooms were cozy, clean, and beds comfortable but a bit odd having interior windows. Sharing bathrooms and showers is a bit unusual, but very clean and convenient. Liked the towel warmer. A plus for flying travelers is that all the bathroom consumables were provided at sinks and in showers. It is a super-convenient base for getting around N. Beach, Fisherman's Wharf, and Chinatown by foot, with Coit Tower just several blocks away. Excellent dining and drinking in any direction and cable car just a block away. The location is excellent. Staff was nice and the decoration was beautiful. Wi-fi worked well, there was coffee and candy and also a few amenities for personal hygiene. Love staying here for its location and funky old historical hotel. it's a simple hotel on a quiet street with shared facilities and courteous guests at an affordable price. San Remo Hotel This rating is a reflection of how the property compares to the industry standard when it comes to price, facilities and services available. It's based on a self-evaluation by the property. Use this rating to help choose your stay! 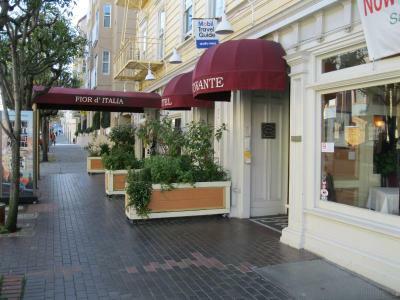 With free Wi-Fi, this cozy European-style hotel is in North Beach within walking distance of Fisherman's Wharf. 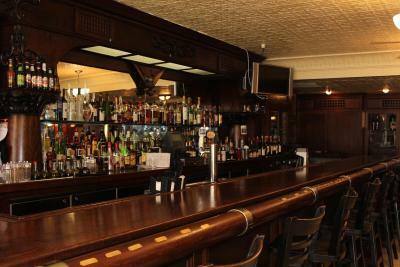 It combines old-world charm with modern amenities, such as free Wi-Fi. 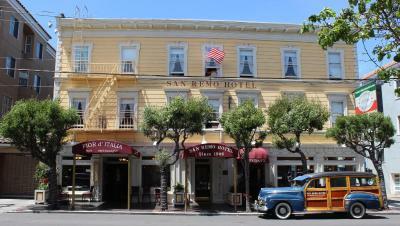 The completely non-smoking San Remo is furnished with Victorian heirlooms and historic photographs. Guests can enjoy cozy rooms complete with pedestal sinks and charming antiques. Shared bath facilities are available on each floor. 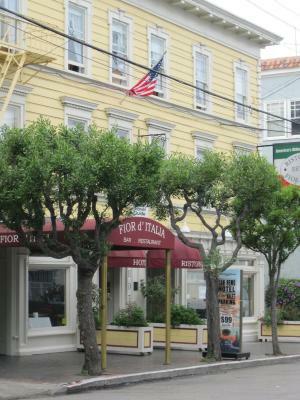 The San Remo is also host to one of the country's oldest Italian restaurants, Fior d'Italia, opened in 1886. The restaurant serves an extensive menu of authentic Northern Italian cuisine. Coffee, tea, lemon water and hot cider are available in the hotel lobby. The San Remo Hotel is in a convenient location, just a short walk from Ghirardelli Square, featuring exquisite chocolate shops and charming boutiques. The Powell Street cable car is only 1 block from the hotel and provides instant access to exciting Union Square. 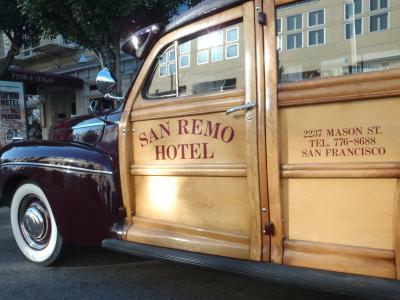 When would you like to stay at San Remo Hotel? This room is furnished with 1 double bed and a fan. Private parking is available at a location nearby (reservation is not needed) and costs USD 20 per day. This room is furnished with 1 double bed, 1 single bed and a fan. Rooms may have shared bathroom or private bathroom. Room type is determined at check-in. Max Occupancy 2 guest. This room is furnished with one double bed. Hotel surroundings – This neighborhood is a great choice for travelers interested in atmosphere, walking and city walks – Check location Excellent location – show map Guests loved walking around the neighborhood! House Rules San Remo Hotel takes special requests – add in the next step! San Remo Hotel accepts these cards and reserves the right to temporarily hold an amount prior to arrival. Upon check in, the guest will be charged a security deposit for incidentals. Upon booking a room, within 24 hours we will charge the first night's rent and tax as an Advance Deposit which is refundable if you cancel up to 24 hours before your arrival date. Upon check-in, the property will place an authorized hold on your credit card for the remainder of your stay and/or for incidentals. No-shows and same-day cancelations will not be refunded the Advance Deposit. Pets are approved on a case-by-case basis. Please contact the hotel and speak to the manager for approval. We are a pension-style, historic hotel. Please be aware that the restrooms and showers are not in the room, but rather down the hall, and are private when in use but shared by all hotel guests. Please inform San Remo Hotel of your expected arrival time in advance. You can use the Special Requests box when booking, or contact the property directly using the contact details in your confirmation. Lack of courtesy from other guests - on both nights that I stayed there were people making unnecessary noise before 7am and after 11pm: the building is old, creaky doors and thin walls mean that any noise will impact on others. The location is excellent, staff are helpful, I felt safe travelling alone - I would say value for money. The mattress was far to soft which kept us awake with a small double bed. I would advise having a twin room in this hotel. Sometimes the bathroom and toilet situation gets congested. The sheets were really scratchy and the pillows uncomfortable. I would bring my own pillow and sheets if I stayed again. Getting to the hotel from Union can be slow since the cable car line is so long, it's better to take the F trolley to Fisherman's Wharf or Pier 39. It's an old and creaky building, you will hear people in the hallway and the floors below/above, although they provided earplugs. I had an internal room (Room 50) so although they built it with enough light coming in, I had to make sure the shades were drawn so people couldn't see inside from the hallway. No a/c (only ceiling fan). Cute hotel, I loved all the decorations, definitely not a bland chain hotel. I was visiting SF after a cross country train trip on Amtrak and looking for a budget hotel and this was definitely a value for what I paid. 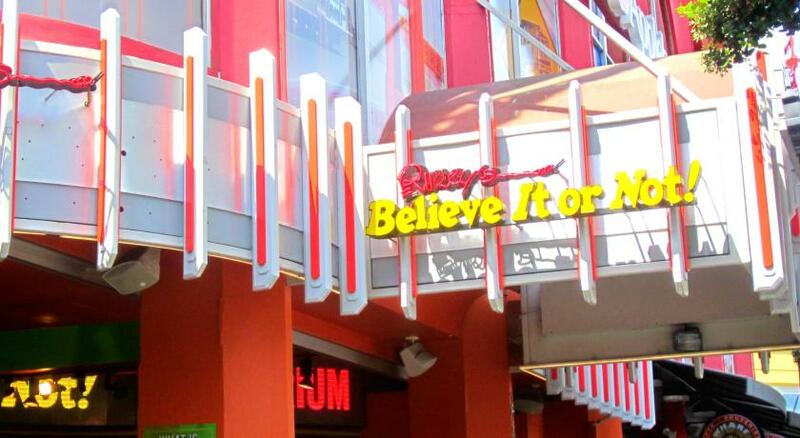 It's very easy to walk to from Fisherman's Wharf/Pier 39. The Powell/Mason cable car is close by and a good way to get to Union Station. The rooms are a little small but there's enough space for 1. I think there were 3 bathrooms and showers available on each floor, it felt like being in a dorm. There's lots of info for sightseeing, if you need it. I appreciated the self service laundry and cheap airport shuttle service available. Lots of places to buy food and supplies nearby. The attached restaurant is convenient and with some good food. Our room at $100 us was very small and no ventilation just a ceiling fan. The air smelt stale. I had to get up every 3 hours to open the door for air. Steep stairs to carry cases. Shared but clean facilities. The other rooms that were larger with a window. The rooms smelled a little musty and old... but it went with the vibe of the place, so it was sort of expected. The atmosphere was awesome! The location was perfect!